I’ll be honest, if my friend Wes of Caesar Salad Recipe Fame hadn’t cooked this dish for me, just reading the recipe, I probably would have skipped it. I don’t know why since I love pork and love cranberries. But the recipe looks a little weird on paper since it has sugar in a meat dish. But I NEVER would have known that if I had not made it for myself. The cranberries plump up. The pork is savory and delicious. It is not at all a sweet dish. You’ll see for yourself and be happily surprised. Possibly also a little addicted to the cranberry pork combination. 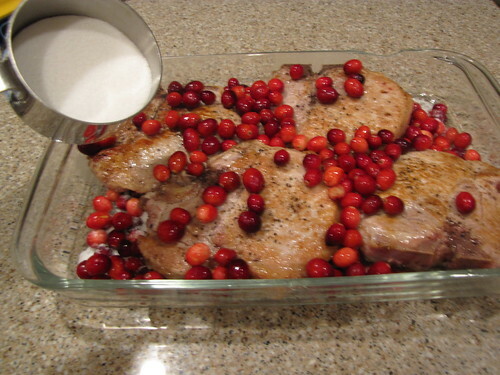 Center Cut Pork Loin Chops, Cranberries, Sugar, Butter, Olive Oil, Salt & Pepper. You also need Parchment Paper and Aluminum Foil for cooking. A note about the recipe — I’ve made this two times…once following the recipe exactly and once forgetting one step. 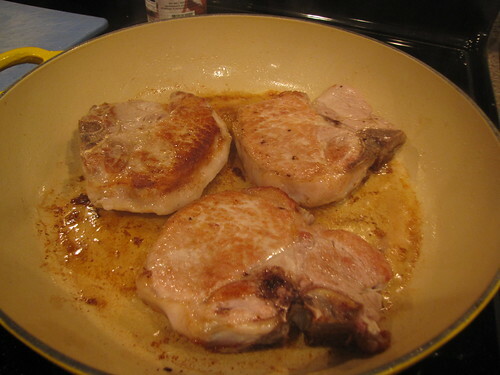 The exact recipe calls for the pork chops to be brined or soaked in a salt water solution for 2 hours prior to baking. 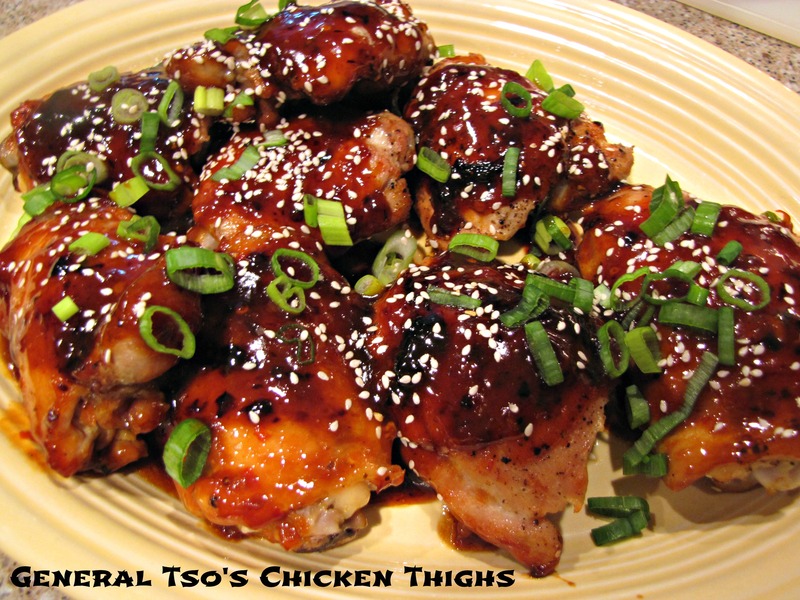 If you have time, this provides amazingly moist, plump meat. However, if you forget and are running around like a crazy person, skip the brining and make the recipe anyway. The pork might not be quite as succulent, but it will still be delicious. Both methods are included here. If you have time to brine the chops for a couple of hours, simply make a salt water solution by combining 1/4 cup sea salt or kosher salt and 1 quart (4 cups) of cold water. 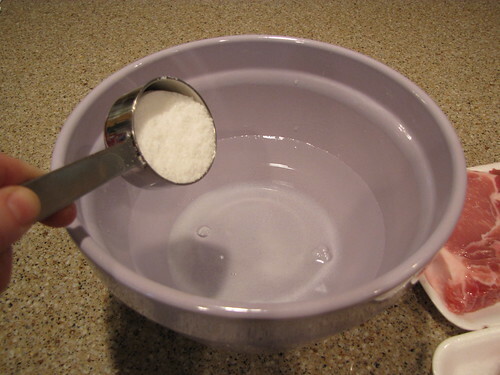 Stir until all of the salt has been dissolved. Don’t use table salt (also called iodized salt) for this step as it is way too salty. By the way, I use sea salt in almost all my cooking. That’s what you see in the squatty little jar in all of the ingredient photos. 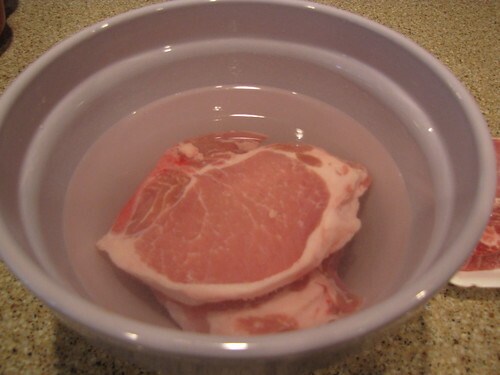 Place the pork chops in the salt water in a large bowl. Cover the bowl tightly with plastic wrap and refrigerate for 2 hours. When you are ready to cook, it is important to rinse the brine off of the chops. 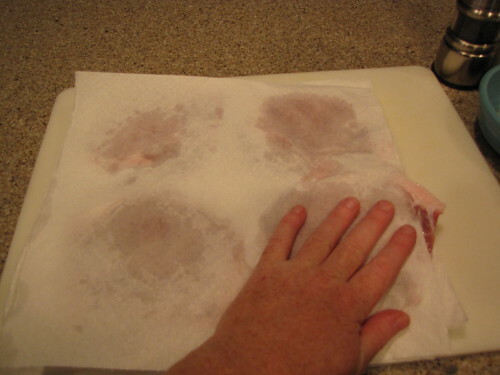 Rinse the pork under cool water and pat dry on both sides with paper towels. Buy 4 bone-in, center cut, pork loin chops about 1/2 inch thick. This is the T-bone of the pork chop family. Melt 1 Tablespoon butter and 1 Tablespoon olive oil (you might need a little more depending on your pan) in a large skillet. 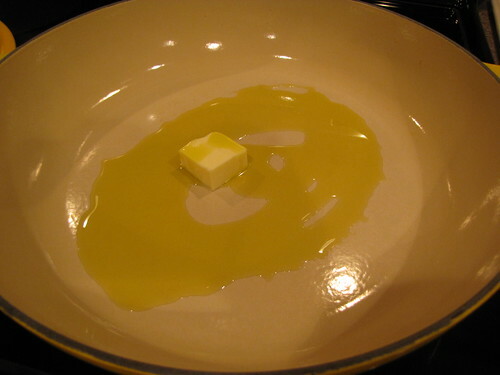 Butter adds flavor and olive oil gives a higher heat for browning without burning. It’s a good combo for browning meats. Place the chops in the pan (I’m working in 2 batches since my chops are large and I don’t want to over-crowd the pan), and brown them over medium high heat. Brown the pork on both sides. This takes about 3-4 minutes per side to get a nice golden crust on the chops. 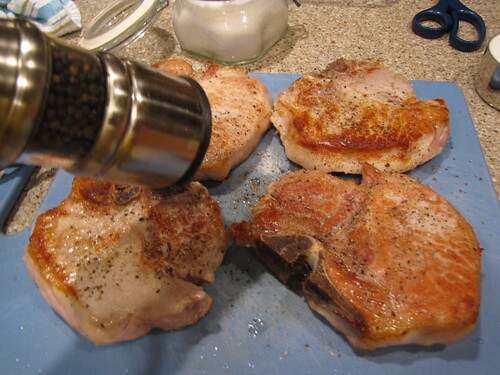 Remove the browned pork from the skillet and season with salt & pepper on both sides. 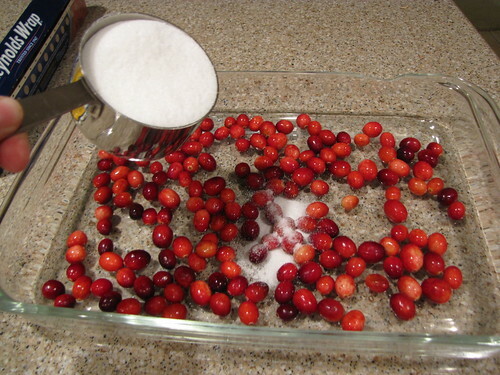 Rinse and pick through the cranberries to remove any unripe or shriveled berries. Place half of a 12 ounce bag of cranberries in the bottom of the pan. Fill a 3/4 cup measuring cup with sugar and sprinkle half of it over the berries. You’ll have half the berries and half the sugar in the bottom of the pan. 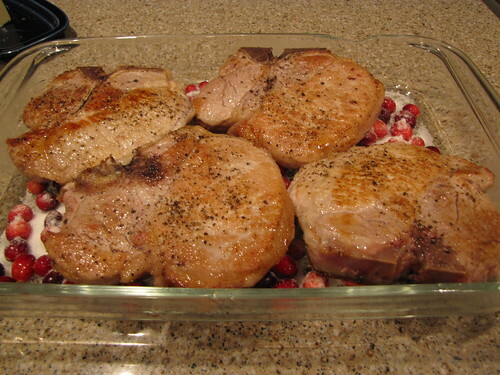 Lay the seasoned, browned pork chops on top of the layer of cranberries in the pan. 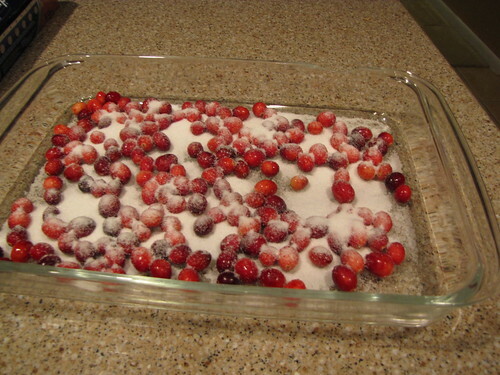 Top with the remaining cranberries and sprinkle with the remaining sugar. Yes, sugar on meat. I know it’s weird…. you just have to have a little faith here. 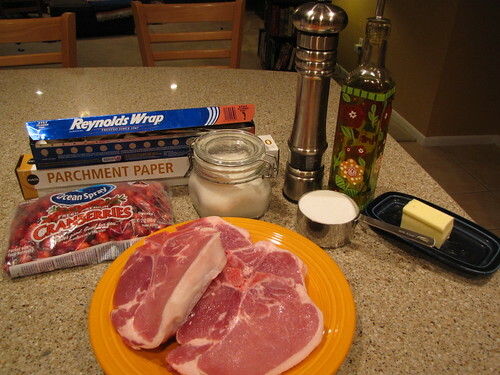 Cut a piece of parchment cooking paper to fit directly on top of the pork chops. You want it to actually touch the chops and berries. By the way, Parchment is NOT waxed paper. 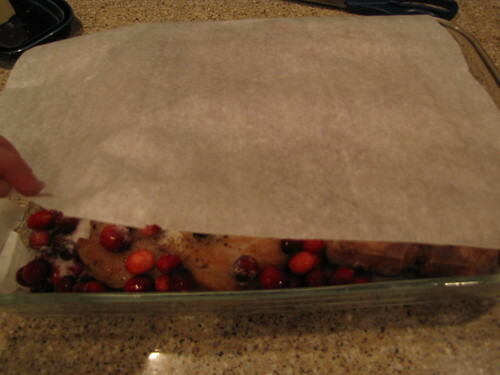 You will find baking parchment in the regular grocery store near the aluminum foil. 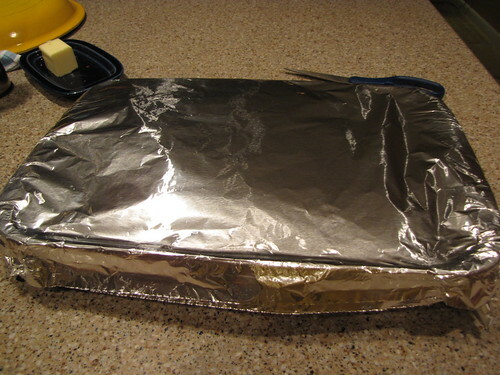 Then cover the pan with TWO layers of aluminum foil being sure to seal all of the edges tightly. Bake the pork chops in a 350 degree oven for 1 hour. No need to peek, stir, or do anything to them during that time. After an hour, you’ll have tender brown chops, glossy plump cranberries, and a tasty sauce. Taste the sauce and adjust the salt and pepper to suit your taste. 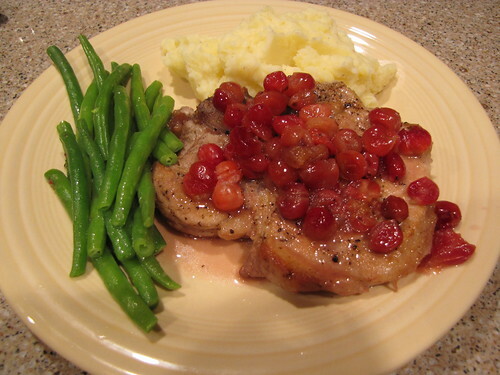 Serve the pork chops hot out of the oven with the cranberry sauce spooned over the top. 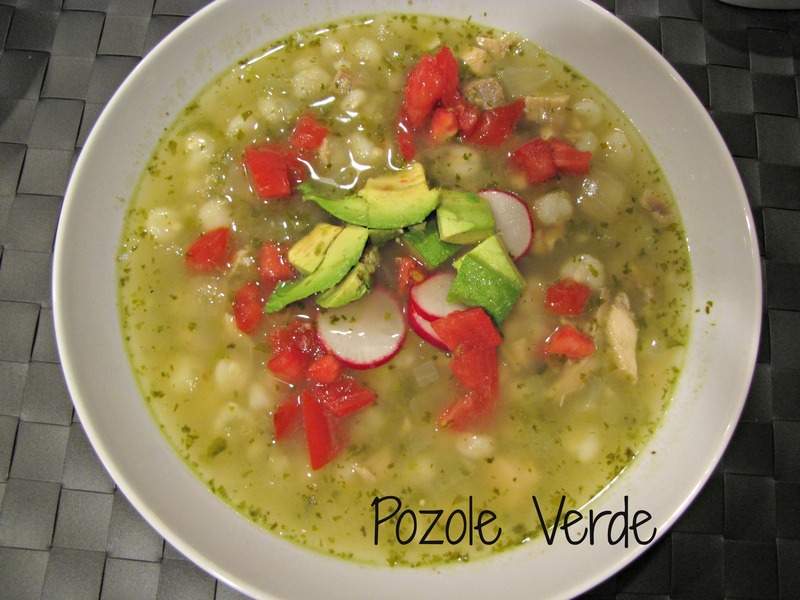 This recipe is great in so many ways. It’s easy. 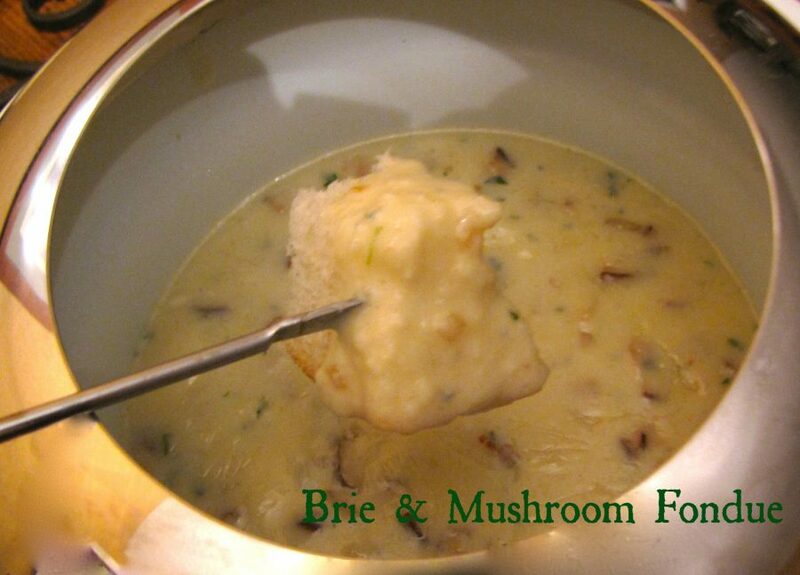 It has very few ingredients and very few steps — brine (or not), brown, bake, and eat. You can cut the recipe in half for 2 people or easily double it (or more) for guests. If you double the recipe, you can layer the pork chops on top of one another with a cranberry layer in between. Just be sure you have a dish that is deep enough so that the juices don’t run over into your oven. The cranberries make it a festive holiday dinner — although I’ll buy and extra bag and put them in the freezer so I can make this in April or May. No reason to save this for only one month of the year. 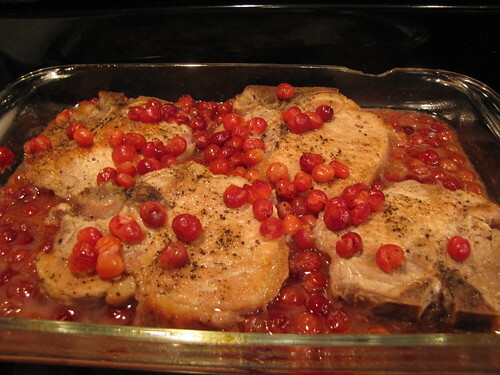 Cranberries and Pork Chops! Adapted from the wonderful cookbook, The Gift of Southern Cooking by Edna Lewis & Scott Peacock. Now this is one good dish!!! In Germany Christmas Dinner is Roast Goose (or Duck) with Cranberries. I personally do not like Meat/Fruit Combos, but Cranberries are tangy and delicious and give that extra zest to good meat! This was great! 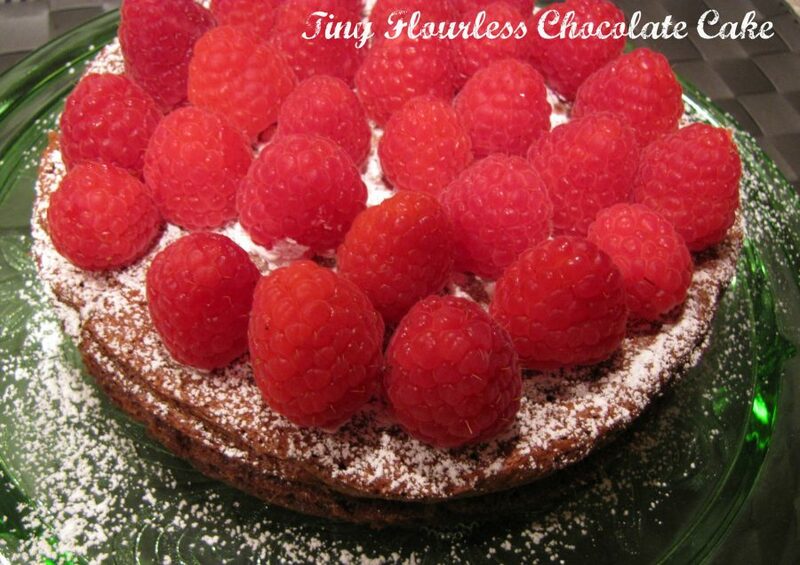 I made this with stevia instead of sugar and the flavor was perfect! I also made a gravy for the potatoes by deglazing the pan with wine and beef broth. My kids were impressed and silent as they scarfed it down! Thank you so much – I’ll be sure to check out more of your recipes! Thanks Johanna! This is a good reminder to me to use up that last bag of cranberries that is languishing in the freezer.